Motorcycle helmets are a simple safety measure -- they keep your noggin safe from objects and falls that would otherwise do it harm. But what if your helmet could help prevent you from getting into an accident in the first place? 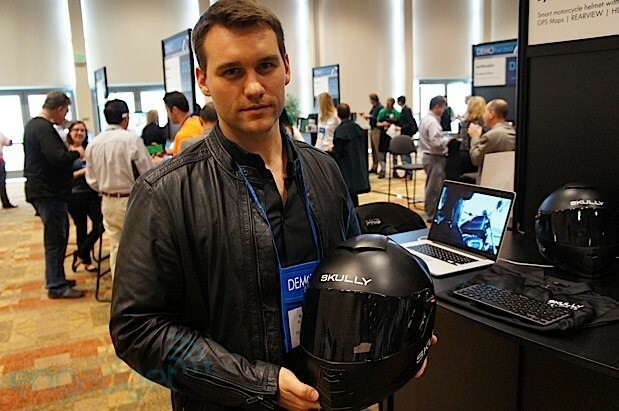 Marcus Weller, founder of Skully, asked just that question, and the answer he came up with is the P-1 helmet. 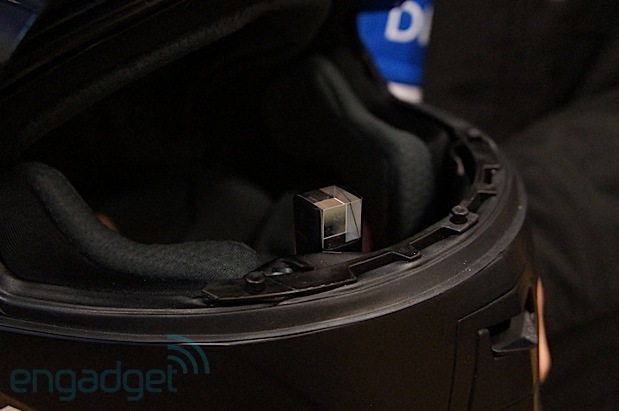 It's a brain bucket that packs a 180-degree FOV rear-facing camera and a micro-controller running a customized version of Android to deliver navigation and video information to a custom-constructed HUD (similar to Google Glass). And, it takes voice commands so that riders can see where they're going or what's behind them, all in hands-free fashion. To provide such functionality, the P-1 has a fin mounted atop the DOT-approved helmet that houses the aforementioned hardware, plus GPS, Bluetooth, an accelerometer, gyro, compass and a rechargeable battery. The plan is for the P-1 to become available for purchase next spring in matte black or gloss white, and it'll be marketed as an ultra-premium helmet (translation: expect it to cost over $1,000). Skully is currently still in the process of developing apps for the thing, but there will be a handful of finely tuned software available at launch. We can say for sure that means the P-1 will provide wearers with navigation and the ability to view the camera feed, with perhaps an SOS function (should the helmet sense an accident) and other apps to come. The company will be opening up the platform so that third parties can code for it as well. We got to speak with Weller about the process of producing the P-1, so join us after the break for more. As it turns out, the idea for the Skully P-1 was born on the streets of Barcelona. Weller was living in the Spanish city a couple years ago and had the misfortune of getting into an accident on his motorcycle while he was searching for road signs to find his way -- that distraction kept him from seeing the car that did him in. Thankfully, he wasn't seriously injured, and that experience gave him a moment of clarity: what if his helmet gave him directions so he could keep his eyes on the road? Upon returning to the US, he decided to build just that. The first P-1 prototype was essentially a display that used wireless HDMI and an external mobile phone to power it. While it worked as a proof-of-concept, Weller quickly discovered that such a solution didn't work so well in a riding environment, and so he decided to create a custom Android build better suited to the limitations of the HUD. He also decided to put all the necessary hardware in the helmet so it could function as a standalone, offline platform. During this process, Weller and his engineers developed some custom code to flatten out the fisheye video feed from the camera (to make it easier to view on the HUD), and crafted a navigation app and auditory interface optimized for riding. They also designed and engineered the shape of the fin that houses all of the hardware to help eliminate ambient noise, thereby improving the voice control UX. While the P-1 is built to work without a data connection, the system has been designed to pair up with a smartphone so that it can give riders real-time traffic updates. And the helmet retrieves software updates via WiFi. Generally speaking, the helmet's been designed so that its feature set can be expanded and improved over the long haul, and won't be constricted by the limits of its built-in hardware. We got to check out the helmet for ourselves, and speaking from a position of relative ignorance (yours truly has never been much of a two-wheeled enthusiast), we can see how the P-1 can be a boon for motorcyclists. Granted the prototype we tried on wasn't running the navigation app, but it did stream video from the rear camera, and the system worked well. The HUD display is mounted on a ball joint, so adjusting it was easy peasy. It's located in the lower right hand corner of the wearers FOV, a position we found to be relatively unobtrusive, allowing us to look around without being distracted. Scanning the room behind us was quite easy as well, as small adjustments to the tilt of our head allowed us to see what we wanted. The display itself performed well, particularly when the helmet's tinted visor was pulled down. The picture did wash out a bit in bright light, but Weller informed us that his team's got some IP that'll let the HUD automatically adjust to ambient light to improve viewability in such conditions. Of course, standing still on a showroom floor is different from rocketing down the road on a Ducati, but it seems that Skully's on the right track to make riding two-wheeled transportation a safer and more enjoyable endeavor.